I’ll just start by saying I loved the first J.J. Abrams film, and it really pulled me into the Star Trek universe in a way that the films before had failed at. That’s not to say I don’t love Shatner and Stewart but after watching a CGI-filled blockbuster it’s hard to go back and watch the version with model spaceships and cheap sets. So I had high hopes for this film and I couldn’t wait to see where Abrams would take his alternate timeline masterpiece. At the end of the first film we saw a reckless and hot-headed Kirk (Pine) overcome all odds and become the confident and collected captain of the USS Enterprise, but by the second we see he has gone back to his care-free ways, giving us two hours to see him again overcome all odds and regain his crews respect. 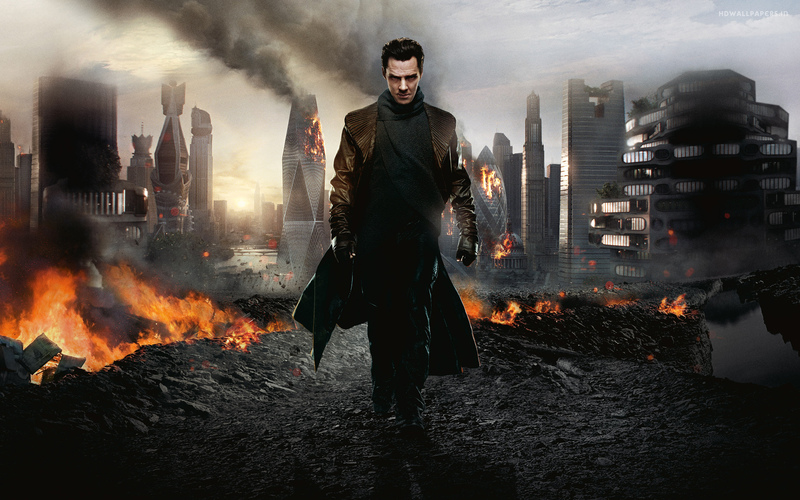 As for the bad-guy, Cumberbatch’s portray of suped-up psycho John Harrison was perfect. In fact it was so perfect that I found myself rooting for the villain to win at times. The film follows Kirk and Spock’s adventure whilst trying to bring terrorist Harrison to justice. It was a thrilling ride which had me never wanting the film to end, and with nerdy references to previous Star Trek films, ridiculously cool fight and space scenes, and blatant/pointless eye-candy half way through, this is a film that I will watch again and again.